The Debug Board v3 is the most recent version of the Debug Board for Neo 1973 and Neo FreeRunner. It is sold seperately from the phones. Serial console and JTAG are very useful (actually, indispensable) for kernel debugging. The debug board provides these key components. Using the hub, you can have access to the phone, JTAG and serial simultaneously, through a single USB cable. You can actually even charge the phone (100mA slow charge) using that downstream port. For the ISB hub function, we use the TUSB2046B chip. 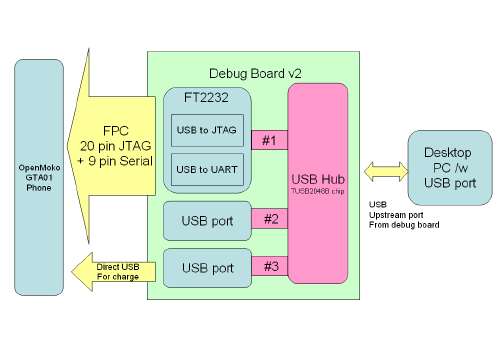 Basically, we integrate a USB-JTAG adaptor similar to the [Amontec JTAGkey-tiny]. The actual reference design that we used (Thanks to Joern!) was found at http://www.oocdlink.com (but the domain has gone). Instead of replicating a true RS232 port, we wanted to use a USB serial converter chip, such as the FT232 or the PL2303. As it turns out, we can even use the second port of the FT2232 simultaneously with the JTAG. So no extra FT232 or PL2303 is required. On GTA01 the CPU UART serial port needed a multiplexer formed by a tri-state driver, since it was both connected to the GSM modem AND to the debug board. We drive the GTA01-tri-state driver mux by an inverted GSM_EN signal (pin 7 on FPC connector). For GTA02 the console serial port isn't multiplexed and connects directly to CPU UART. Your Debug Board contains a small serial EEPROM which should be flashed correctly during production. However, some boards have received incorrect/incomplete programming during production and thus you should verify this. If the board shows up as USB ID 1457:5118, then everything is correct. Only if your board shows up as USB ID 0403:6010, then you will need to flash the board! NOTE: FIC has done that for you, in case you have officially been supplied with the board. However, if you are one of the early adopters, the configuration and USB vendorID / productID might have not yet been set correctly. NOTE: Some distros no longer name their USB subsystem usb_device, but uses simply usb instead (e.g. Ubuntu 8.x). If so, you should change the line with SUBSYSTEM accordingly, otherwise the device will not be recognized by the udev rule. The recommended connection sequence given in Debug Board v2#Hardware connection may not work for debug board v3 and the FreeRunner. It seems impossible to turn on the FreeRunner after plugging the FreeRunner USB cable into the PC, but before plugging the debug board USB cable into the PC. After the debug board is powered by the PC, the FreeRunner should start. User:Cfriedt 20081021 The Debug Board v3 uses 3.3V signalling levels on J1 (the 20-pin ARM JTAG port). Many other ARM devices use 1.8V signalling. For the next Dboard hardware revision, I would suggest using the same level-shifter as the FlySwatter. The FlySwatter uses two SN74AVC4T245 (ref) buffers to provide a signalling range of 1.2V to 3.6V (ref). The Linux kernel of your host system will create a virtual serial device called /dev/ttyUSBx where 'x' is a sequentially assigned number. If you don't have any other USB serial converters attached to your machine, the device name will be /dev/ttyUSB1 (baud rate 115200 8N1). You can use your favourite terminal emualtor (minicom, cu, zc, ...) just like for any other/real serial port. You may use gdb as well (eg. target remote /dev/ttya). Once you have installed libftdi >= 0.8 and configured OpenOCD with the correct openocd.cfg from OpenOCD#openocd.cfg, it should work just fine. Please see OpenOCD#OpenOCD_and_Debug_Board for some more information. We previously had Neo1973 Debug Board v1 (inherited from some weird engineers who must have seen Brazil too often). Version 1 was never shipped to phase-0 or phaes-1, and not sold to anyone.